Here’s a good one from the Library of Congress archives. It’s a drawing of the proposed new Executive Mansion, to be built on Meridian Hill (where the park is today). 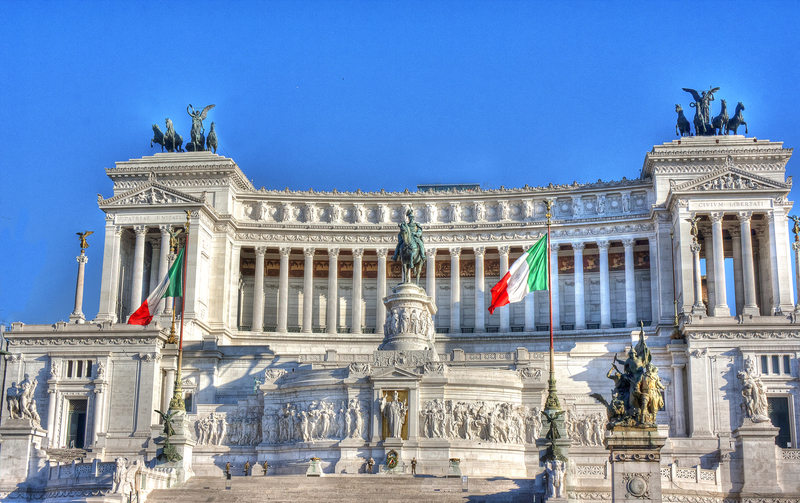 It looks quite ostentatious for American tastes and, in my opinion, resembles Il Vittoriano in Piazza Venezia, Rome (look here … thanks Andrea, great photo blog!). The drive for a new White House on the hill was really championed by Mary Foote Henderson, who happened to live across 16th St. from the hill. I’m sure she and her husband stood to see a mighty profit from an increase in land prices, because they had purchased enormous tracts of land up and down 16th St. Her hopes were to have a grand boulevard of embassies and fine mansions going up the street. These plans date back to 1900, right around the time when Teddy Roosevelt was looking to expand and built the West Wing due to overcrowding the White House. Luckily (in my mind), this never came to fruition. A great park was eventually built with the backing of Mrs. Henderson on Meridian Hill, topped off with a statue of Joan of Arc, a gift from France. Check out a closer view o the proposed giant mansion below. It’s quite an amazing structure, far greater than the White House of today. By the way, who was Mary Foot Henderson? She was the niece of a senator from Connecticut and the wife of a senator from the Show-Me State (i.e., Missouri). She was kind of a big deal in Washington high society and owned the bulk of land going up 16th St. NW. Senator and Mrs. Henderson lived in a large stone mansion (more like a castle) at 16th and Boundary Rd. (16th St. and Florida Ave. NW). It was knocked down some time ago to build Beekman Place. The stone wall going up 16th St. on the left is all that remains. Read more about her on Wikipedia. Also, here’s a cool post about the Henderson castle, and a great photo of it is below (from the D.C. Public Library Flickr photostream). Want to see some other cool buildings that were never built in Washington? There is a cool list of them with proposed architectural drawings here. Wow, some of them are horrendous.